. 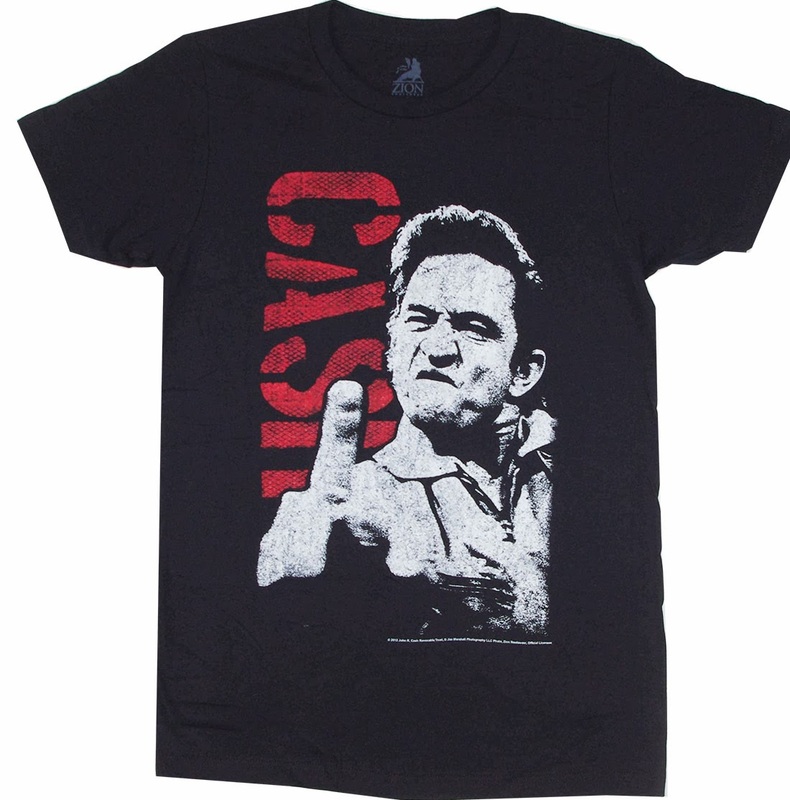 Old School Tees Blog: Why is Johnny Cash flipping the bird on a t-shirt? The photo was not made famous until 1998. Johnny was working with the producer Rick Rubin at American Recordings. Rubin started out as the DJ for the Beastie Boys, and had worked as a producer with a number of rock, metal, and pop bands. Rick introduced Cash to a new generation of musicians. The resulting cross-pollination reinvigorated Cash’s career and won him fans across multiple genres. The Man In Black was back! Their second collaborative album Unchained won the 1998 Grammy for Best Country Album. 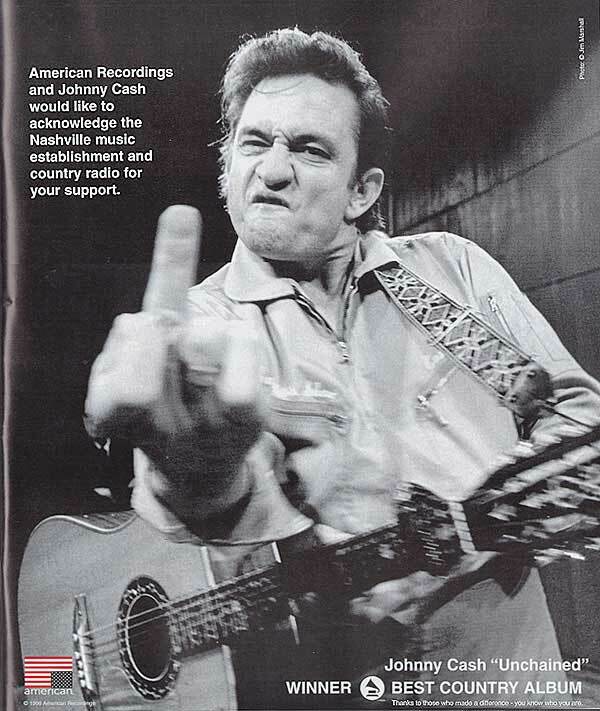 Despite the critical recognition and commercial success, Nashville and country music radio was not supportive of Cash’s new venture. He got almost no airplay on traditional country stations and Nashville snubbed him. Rubin was not very familiar with the genre, and did not understand the lack of support. He took out a full page ad in Billboard Magazine, with the picture of Cash flipping the bird, and included the text “American Recordings and Johnny Cash would like to acknowledge the Nashville music establishment and country radio for your support”. Although it was before images “went viral” the sentiment struck a chord with a number of other artist who felt that the country music establishment was too inflexible with the definition of the genre. Willie Nelson reportedly hung the ad up on his tour bus, “John speaks for all of us. Everyone who comes in has to see it." It has since become a legendary and iconic image. John R. Cash September 12, 2003 at the age of 71. He was not confined or defined by musical genres. This refusal to be limited, and his considerable crossover appeal earned him the rare distinction of induction in the Country Music Hall of Fame, the Rock and Roll Hall of Fame, and the Gospel Music Hall of Fame. I think it is great when celebrities give back. Although, he was only prosecuted for misdemeanors, he understood the lonely feeling of being in jail. His last video was really chilling to me, it seemed as if he knew he was going to pass away. I thought his movie was really interesting and sad. Yeah, that was sad when his brother died. It reminded me of when Ray Charles Brother died in his movie. I'd never heard that, it's an interesting story. Love the picture - giving it to the MAN! I didn't know he had been arrested that many times. Has anyone seen the film "Walk the Line"? A great film but I don't think it paints a picture of the REAL life of Johnny Cash, well I suppose it does in a way but it misses out a lot of the best parts. I guess they were afraid it could give off a lot of negative vibes to his image as it would be impossible to sum his entire life into one movie. I love it when an artist will not be defined by the music industry. There is no such rule that an artist can't break out of a genre! The ones that do are really creative and fun to listen to. I'm a huge Cash fan to this day and his songs have great lyrics that tell it just how he sees it. I love the version of HURT he did also, taking a newer song and making it his own with his own signature sound. He is an icon! What is everyone else's favorite Cash song? the t-shirt you have posted as an example, what a freaking cool tee ! And the last video was amazing, Johnny Cash, Rick Rubin and Trent Reznor Coloborating on The song " Hurt " one of the best songs in the history of music ! Johnny Cash was known as a country star, but he sure acted every bit Rock n Roll ! Gen x blogger above me asks a great question, what is your fave Johnny Cash song ? I would have to say " Hurt " what about you ? What's your favorite Cash song ? mine is the velvet undergrounds first album with the banana on the cover, makes for a sick looking t-shirt !